The Smoking Gun is reporting that Aaron and Christine Boring of Pittsburgh are suing Google for “intentional and/or grossly reckless invasion” of privacy because their luxurious Pittsburgh home is viewable on the internet through Google Maps' Street View feature. 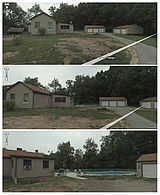 In the suit, the Borings allege that they bought their house -- which has two garages and a swimming pool -- in 2006 “for a considerable sum of money” and that a significant factor in their purchase decision was "a desire for privacy.” Unfortunately for the Borings, when Pittsburgh was added to the cities covered by Google Maps’ Street View feature, the Borings' home became viewable to the whole world. The Borings allege that this has caused them mental suffering and has diminished the value of their home, and they have requested $25,000 in damages. According to Techtree.com, "While Google is believed to be reviewing the suit, the pictures now stand removed from their Web site." This is one of the flaws of Google Maps Street View, the possible invasion of privacy the moment a private property is shown on it. Interesting post though, very informative.